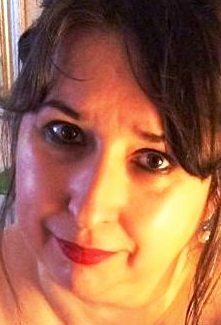 During a reading the other day, with a delightful client; charming, brave and resourceful, we looked first at a number of questions focussed on her two businesses. Then the conversation moved to children’s activities and prospects, and in respect of her son, 18, I drew the Four of Cups and said, is this how he’s been sometimes, lately? Fed up, irritable and restless, wanting to do something new but not yet able to decide, or make a start? The card prompting this question was the Four of Cups, a card commonly nicknamed ‘the bored boy,’ and whether you’re a boy or not, it’s an unpleasant state of mind, even while it’s not exactly a problem you can do nothing about. 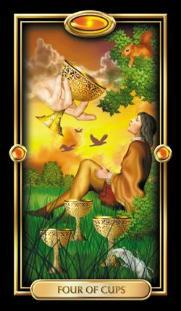 I was using The Gilded Tarot, images by kind permission of Ciro Marchetti. So, what might be the path ahead for him? I drew The Eight of Pentacles, and as you can see, it shows an apprentice at work, happily engrossed, so much so, he is burning the midnight oil, watched by a mouse who’s probably hoping for a crumb of his supper. ‘I think he will do well in an apprenticeship, head and hand working together in unity, making or crafting something,’ I said. He was wondering about something like that, the client said, maybe technical drawing. OK then, his next port of call is sorted, and if he doesn’t end up there exactly, it will be something of that kind. The 4 of a bored boy becomes the 8 of a busy boy, and to be busy, is very often to be happy. Is the word or idea of the RAF anywhere written in the cards? No, of course not. This was just another instance of a word springing out, using a card as a diving board. Gob-shiting, I call it. 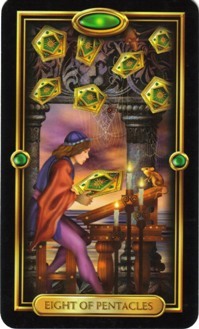 Such are the various ways of reading the Tarot.